here for the music, not the writing! We bring you the best new music that we think you should hear! If you like it or heard it already, share the posts and lets spread the word! Or keep scrolling for the best bits! What does MNJ stand for? MNJ stands for My New Jukebox. George Nicholls, founder of MNJ wanted to share his passion for music with all of you lot , and wanted to find something that could best represent the music world, that is always changing but can never forget where it has come from. 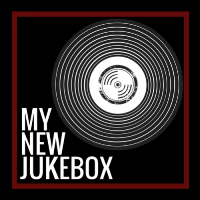 Drawing inspiration from the classic jukebox that was always full of classics and the best new tracks , George started MyNewJukebox. Constantly being updated as we learn and explore together! Going viral and shooting to fame by shocking Pharrell Williams with the perfection of her track ‘Alaska’ wasn’t enough! Now Maggie Rogers is back to prove herself and win the hearts of the rest of the world with debut Album ‘Heard It in a Past Life’. MNJ favourites, Beatenberg, return with new album worthy of any South African Indie-Pop god! Today’s MNJ New Music Spotlight is on Electro-pop star LAOISE! Her latest track must be added to all your playlists! Today’s new music spotlight is on Bristol-based Swimming Girls. Today’s MNJ New Music Spotlight is on Essex and London based Punk-Pop duo, DOLLS. Today, our new music spotlight is on bubble gum punk rockers Calva Louise from London. London based trio Wyldest deserve to be the first MNJ New Music Spotlight Artist, so watch this space! This week we haven't been able to stop playing this cover of Green Day's classic track 'Basket Case'! It's perfect!! Do you want MNJ to have a listen and review your music? You think you or your band deserve to be on MNJ? Follow the link below and find out what you need to make it happen! MNJ brings you the best new exciting artists and bands from around the world that you need to listen to more! ‘Must listen’ tracks from your favourite artists, and some you may not know! Melbourne based producer and singer-songwriter Woodes brings us a track full of potential. Perfect track to sit back and chill to. One to watch! A great cover of a classic Christmas track from last weeks 'Artist of the Week'! The first official Track of the Day on MYNEWJUKEBOX goes to Gingersnaps with 'Number Crunching'!A track full of fun that everyone will be able to sit back and just chill to! Artist profiles of hot bands/artists that you might have heard of! If you think you could never become a crying blubbering mess by listening to a song with lyrics you don’t have a hope of understanding, you are about to be proven wrong! Somewhere, there are several middle-aged men kicking themselves. Beatenberg - South African Pop-Rock sensations! Have you ever dreamt of writing about music or your favourite bands? Wanted to write about the gigs that you’ve been to? We are currently looking for new writers with passion! Follow the link below to find out everything you need to know!